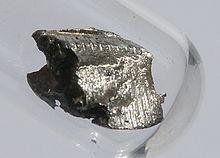 Cerium is a chemical element wi seembol Ce an atomic nummer 58. It is a saft, silvery, ductile metal which easily oxidizes in air. Cerium wis named efter the dwarf planet Ceres (itsel named for the Roman goddess o agricultur). Cerium is the maist abundant o the rare yird elements, makin up aboot 0.0046% o the Yird's crust bi wicht. It is foond in a feck o minerals, the maist important bein monazite an bastnasite. Thare a wheen o ommercial applications o cerium. Thay include catalysts, additives fur tae fuel tae reduce emissions an tae gless an enamels tae chynge thair colour. Cerium oxide is an important component o gless polishin pouders an phosphors uised in screens an fluorescent lamps. It is uised in the "flint" (actually ferrocerium) o lichters. This page wis last eeditit on 26 Februar 2018, at 07:47.